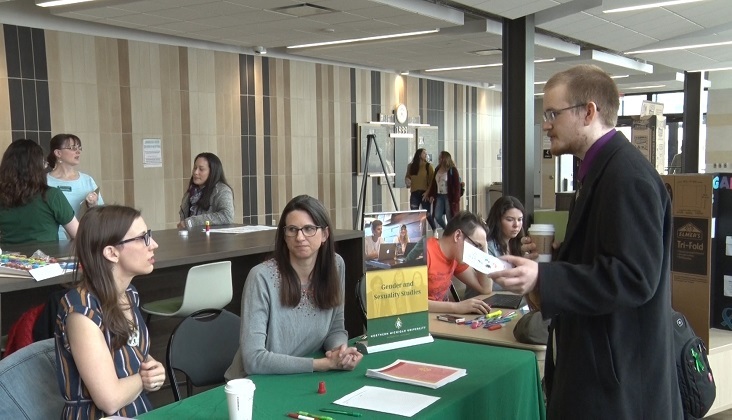 MARQUETTE — Northern Michigan University held their 2nd annual Gender Fair this morning in the lobby of Jamrich Hall. The fair offered informational booths and various discussions to spread awareness, education and conversation about gender and related topics between students, staff and the Marquette community. The NMU Gender Fair is hosted by the gender and sexuality studies minor program. Its purpose is to create and enhance diversity and inclusion on NMU’s campus. “Not a lot of people know about all issues related to gender and sexuality. Sometimes students or community members aren’t aware of the resources that the LGBTQ community need or the resources that are available,” said Dr. Rebecca Ulland, Director of Gender and Sexuality studies program. During the event, the restrooms on the first floor of Jamrich Hall were gender-neutral.